3. Which feature supports higher throughput in switched networks by combining multiple switch ports? 5. What is the likely impact of moving a conventional company architecture to a completely converged network? There is less bandwidth competition between voice and video streams. 8. Configuring communication between devices on different VLANs requires the use of which layer of the OSI model? 9. 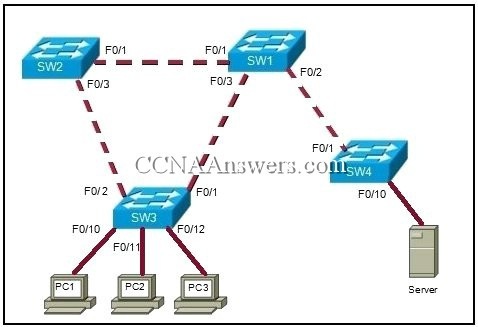 Which layer of the OSI model does an access layer LAN switch use to make a forwarding decision? 12. Which hierarchical design characteristic would be recommended at both the core and distribution layers to protect the network in the case of a route failure? 13. At which heirarchical layer are switches normally not required to process all ports at wire speed? 14. For organizations that are implementing a voice over IP solution, what functionality should be enabled at all three layers of the hierarchical network? 16. Link aggregation should be implemented at which layer of the hierarchical network? 17. What statement best describes a modular switch? 18. Which layer of the hierarchical design model provides a means of connecting devices to the network and controlling which devices are allowed to communicate on the network? 19. A technician is attempting to explain Cisco StackWise technology to a client that is setting up three stackable switches. Which explanation accurately describes StackWise technology? Refer to the exhibit. 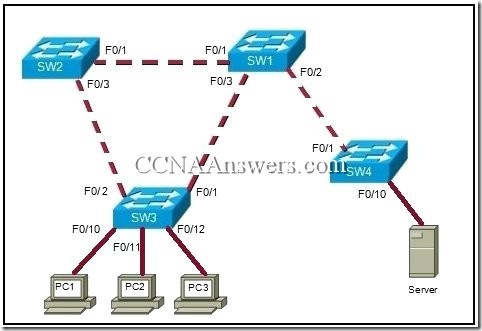 What characteristic of hierarchical network designs is exhibited by having SW3 connected to both SW1 and Sw2?